Pregnant Duchess of Cambridge was full of the joys of Spring tonight as she showed off her blooming baby bump in a sleeveless dress. 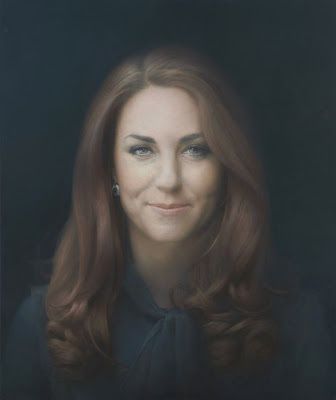 Kate, who is almost seven months pregnant, made her second public appearance in as many days visiting the National Portrait Gallery for her charity The Art Room. 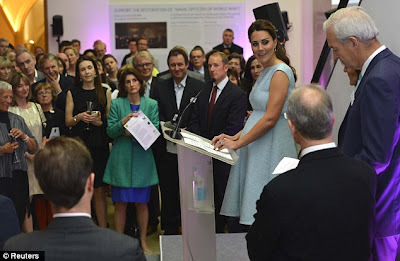 She was the guest of honour at a reception to celebrate the charity's 11th anniversary for 250 guests including children and their teachers. Looking tanned in a pale blue Emilia Wickstead cocktail dress and grey suede heels with her hair half-up and wavy, Kate arrived at 7.30pm and was greeted by Art Room founder Juli Beattie. She watched a brief video about the charity before making her second speech in as many days. Kate said she had been "overwhelmed" by the "transformational" work of the Art Room, adding: "I'm a firm believer in the power of art to make a difference." Afterwards fellow Art Room supporter broadcaster Jon Snow said to laughs from the Duchess: "If she can turn out at this stage of her pregnancy for this cause it must be big!"